The event nobody has been waiting for has happened anyway: I have recorded my very first video. In blogger circles we like to call the end product a "vlog" (=video blog), and for some masochistic reason I have been wanting to do one for a while. Actually, for quite a while: the first attempt was done with the Christmas tree in the background. That one never saw the light of day, and several more attempts over the last few months joined that first one on the discarded pile. Guys, if you have never tried to record yourself, give it a try. Just do it, and see how you like it. It is one of the most awkward things ever: staring at yourself, talking without a conversational partner, no time to sit back and think about what you want to say. Why torture yourself then, you may ask? Well, there are several reasons: I love watching other people's vlogs. Love, love, LOVE it! To hear the voices and accents of the people whose thoughts I know so well, just makes me feel like I get to know them even better. A person's voice is sort of a big deal, and elevates the relationship to a new level. So that's why I decided to take the plunge. This morning, when I was scrolling through my Bloglovin' feed, I saw Jenn's vlog (you did an amazing job, btw!) and I was overcome by the overwhelming urge to join her. So I did. And here it is. Eeks! I did it all in one take, no do-overs. Experience has taught me that it usually gets worse after the first try, so I left it at that. I am astonished at the amount of eye widening I am doing - what the hell? Do I do that IRL? Why? It's a bloody mystery. I also don't know how to edit, so this is the raw thing in all its unedited glory. 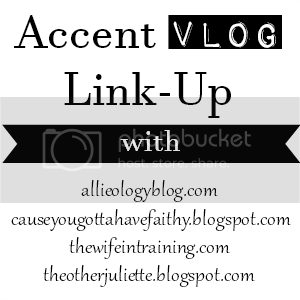 If you want to see much better vlogs, check out the linkup below. I love your accent! I love vlogs. I am seriously addicted to watching them on youtube and blogs. I plan on starting a vlog very soon. Oh I love this!! I have great admiration for anyone brave enough to create a vlog :) I love watching them, but can't imagine how difficult it would be to put one together. You did such a great job - thanks for sharing! Such a great vlog! I loved hearing you speak German, like I said my grandparents are German and I just love hearing the language!! i loved it... you are more adorable than ever !!! You are too kind Erica! It was so nerve wracking doing it, but once in a while I get the urge to get out of my comfort zone - and now I want to learn more about the ins and outs of making videos! I looooooove it!!!! Your accent is AWESOME. It is so fun to put a voice with the gal and the blog that I adore so much. (That's you, obv.) Love the vlog, friend. Congratulations of your first vlog!!! That's my Miriam, for sure :) Loved listening. I was watching you with a smile on my face. Btw, I love how you say "pajamas" and "crackerjacks"
I love you accent in your vlog. so cute. So awesome that you say Pee-can like I do and i'm from GA. awesome. And you say Buggy. I love it. And those bugs are rolly pollies. OMG...love it!!! You are so cute :) This was great and I loved you could hear the ducks in the background! !